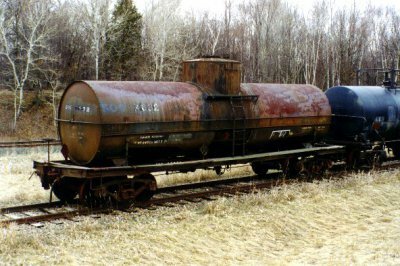 Soo Line tank car X632 was built in June 1947 by American Car & Foundry. Its original number was 40977. The journals are friction-bearing. 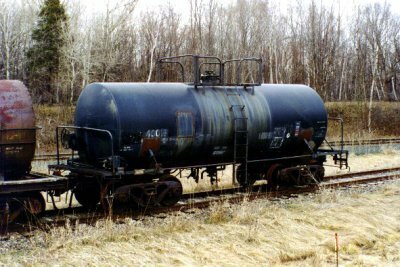 GATX tank car 40015 was built in September 1971 for hauling corn syrup. In 1995 it was donated to the Minnesota Transportation Museum. The journals are roller-bearing with standard rotating end caps. 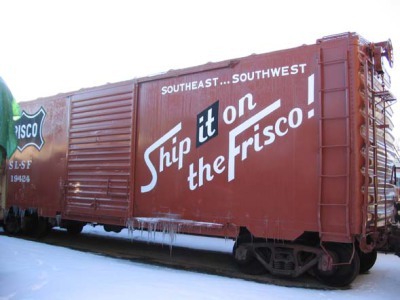 To keep the reefers filled with ice, the railroads treated the loaded reefers as top-priority freight, and every few hundred miles kept an ice house where crews would slide blocks of ice from a roof-level platform, across a gangplank, and into the reefer's ice bunkers. When the grain was loaded, wooden boards were placed across the door opening to hold the grain in, because it was loose, not bagged. To unload, men used wooden plows pulled by ropes from outside to scrape all the grain out. Marks inside the car indicated how much grain could be loaded, depending upon the density of the different grains. 134216 probably dates from the 1920's. (Author's guess.) It shows evidence of having had K triple valve air brakes, which were outlawed in the early 1930's. It has a staff-type handbrake which would be operated by the brakeman standing on the roof - a 19th century practice. The steel framing, however, suggests it was built after the turn of the century. The visible steel framing was probably dictated by a desire to reduce dead weight (increasing payload capacity) while leaving a smooth interior surface for easier unloading. It is essentially a stud wall finished only on the inside. 134216 ended its tenure on the Soo Line in work train service. The interior has been fitted with workbenches and storage racks. Built by Pullman-Standard 8-57. Has friction bearing journals. Acquired 1987. Built August 1940. Has friction bearings. Acquired 1988. 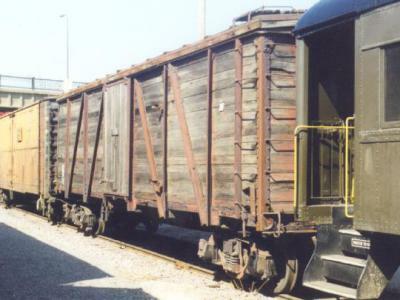 This is one of the few pre-World War II boxcars in our collection. Built 8-52 as Great Northern 20522. Has friction bearing journals. Built November 1959. Acquired 1987 as BN 199625. Repainted in June 2005 back into Chicago, Burlington, & Quincy Chinese red. Color was computer-matched from samples off the car. Has friction bearing journals. GN 13397 was constructed by the Great Northern's St Cloud shops in August, 1960. It was part of the series 11880-11887 and 13000-13499. 11880-11887 were prototypes rebuilt from other cars, while 13000-13499 were new construction. All were built under Authority for Expenditure 91867. The AAR car type designation was 'XM'. Never repainted in BN Cascade Green, or renumbered into the BN number scheme, it was retired and donated to MTM when BN's Como Shops closed. MTM leased space there, and during the closure had the opportunity to take several "to be repaired" boxcars and stuff them full of cast-off shop tools and repair parts. It spent several years stored in the Twin Cities Army Ammunition Plant in Arden Hills, and eventually moved to Jackson Street in about 2003. The peculiar double-door arrangement, with one 'normal' sliding door and one plug door, was devised to make box cars more flexible. For shipping grain (in the days before covered hoppers) the 'normal' six foot wide sliding door was the correct width for the boards used to hold the grain in. For other lading, the plug door made a wider 12' 3 1/4" opening, which was more convenient for driving a fork lift in and out. GNRHS reference sheet 331 has a photo of new (or near new) sibling 13383. The angle is the same as the picture above, and the resemblance is striking. That reference sheet also has a reproduction of the equipment diagram. "Great Northern's ''Glacier Green'' Cars - A Photo Roster" (Great Northern Railway Historical Society Reference Sheet #147) by Staffan Ehnbom; data p5. "Great Northern Box Cars - Numbers 11875-17999" (Great Northern Railway Historical Society Reference Sheet #331) by Staffan Ehnbom; data p6. "Great Northern Equipment Pictorial Book Two - Freight Cars," by Scott R. Thompson; data p118. Built by Pullman-Standard 12-52. Has friction bearing journals. Built May 1956. Has friction bearing journals. Stencilled on the center sill is the original car number, GN 3533. Built September 1947. Has friction bearing journals. 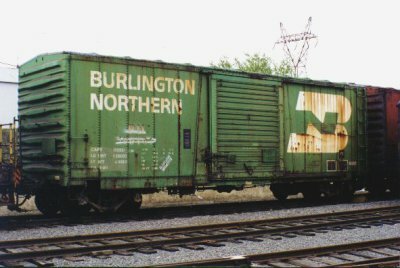 According to the Burlington Northern Car Index web page, maintained by the Friends of the Burlington Northern, 189706 is from series 189000 - 189799, originally CB&Q 29000 - 37749. Built in May of 1967 by Pacific Car & Foundry. 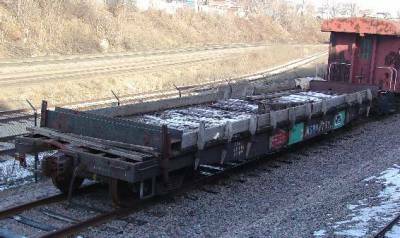 It is a 50' plate-C high capacity box car, with cushion underframe, ABD brakes, roller-bearings, and double plug doors. BNSF donated "identical triplets" 236407, 236660, and 375845 in June 2004. This car series was built by Pacific Car & Foundry in 1967, and delivered in Big Sky Blue. 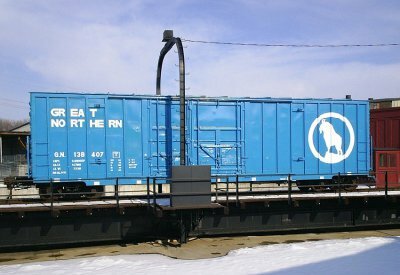 Big Sky Blue was the Great Northern's last paint scheme before the Burlington Northern merger. It was introduced in the spring of 1967 by a secretly-painted train of business cars, and was to be applied to all rolling stock. However, not everything got repainted by the 1970 merger date. It is said the same design firm in St Paul designed both the GN "Big Sky Blue" and BN "Cascade Green" paint schemes. They are very similar. 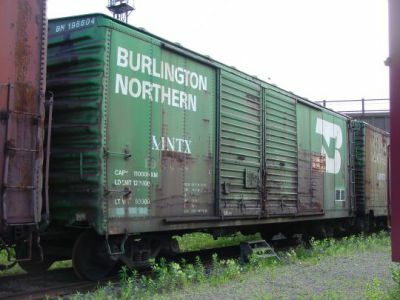 After the GN merged into the Burlington Northern, the cars were repainted in the BN's "Cascade Green" colors and renumbered from 138nnn to 236nnn. 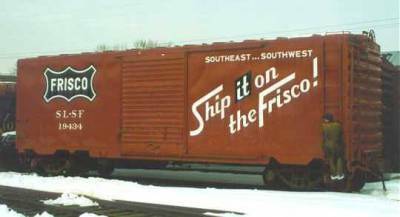 The BN itself merged into the BNSF in the 1990's, but the cars were not renumbered or repainted for BNSF. 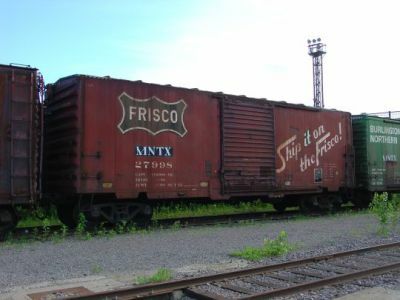 In 2004, BNSF offered MTM four of these boxcars. They had been retired early due to bad-order doors, declining need for general-purpose boxcars, and proximity to mandatory retirement age. One made it to the scrapper too quickly, so the remaining three "identical triplets" 236407 (GN 138407), 236660, and 375845 arrived in June 2004. When they arrived they showed their 37 years of service. Museum shop forces first straightened the bent door hardware so the doors worked again. The previous road numbers were readily determined - BN had painted them on the center sills. Built in September, 1967 by Pacific Car & Foundry. 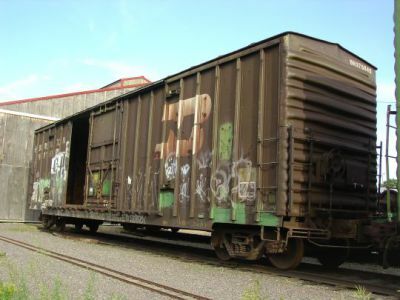 It is a 50' plate-C high capacity box car, with cushion underframe, ABD brakes, roller-bearings, and double plug doors. These cars were delivered in the then-new "Big Sky Blue" corporate colors. In June 2004, BNSF donated "identical triplets" 236407, 236660, and 375845. They had been retired due to bad-order door mechanisms and their proximity to mandatory retirement age. The original number, GN 138660, was known with certainty because of the BN practice of stencilling the original road and car number on the center sill. The paint is a PPG industrial catalyzed urethane, computer color matched from original GN paint samples. The lettering was done with hand-cut paper stencils, synthesized from historic photos and current car data. The logo circle was drawn to the correct radius with a trammel, and "Rocky" filled in free-hand by transferring grid points from a photograph. It rolled out of the paint shop and into the bright sun on Saturday, February 19th, 2005. Built 1967 as Great Northern 138687. 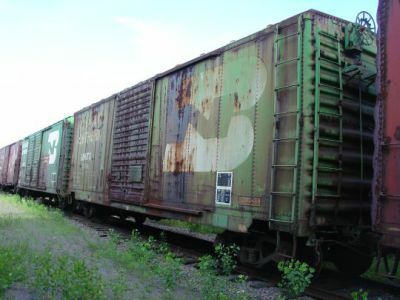 It is a 50' plate-C high capacity box car, with cushion underframe, ABD brakes, roller-bearings, and double plug doors. BNSF donated "identical triplets" 236407, 236660, and 375845 in June 2004. This car series was built by Pacific Car & Foundry in 1967, and delivered in Big Sky Blue. 236660 and 236407 have been restored to their as-delivered appearance. 375845 had been retired early due to bad-order doors. Notice one door is missing in the photo - it had been placed inside and welded to the floor for safe keeping. Museum shop forces straightened the bent door hardware and re-hung it. Of the three, 375845 is unique in that the BN modified it and renumbered it. (When first renumbered, it was BN 236687.) Therefore, the museum plans to restore it to BN Cascade Green rather than GN Big Sky Blue. 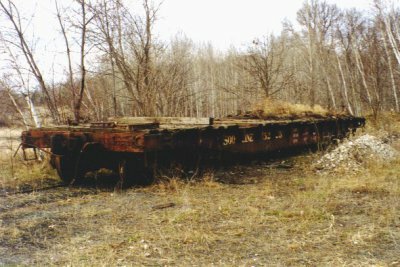 Soo Line flat car 5225 was built in July 1941. Journals are friction bearing. Northern Pacific 61248 was built in September 1937. 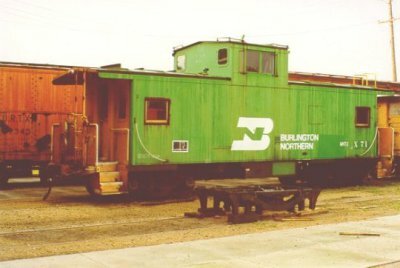 After the Burlington Northern merger, it became BN 959439. (Identification is easy - BN always stencilled the original car number on the underframe.) Acquired by MTM in 1985. Goes with 150-ton crane GN X1735. Has friction bearing journals. Minneapolis Northfield and Southern 900711 was built in January 1966. 900711 is a Soo Line number - we haven't sorted out its original MN&S number yet. Acquired by MTM in 2004. This modern, all-steel caboose was built by the International Car Division of Morrison International Corporation in December, 1963. It was part of two orders for thirty cars (X66 through X85, delivered in '63, and X86 through X95, delivered in '64) which were builder's lot 845. The new steel cabooses replaced older wooden ones, such as X216 and X240. International offered three basic caboose designed: Standard Cupola, Extended Wide Vision, and Bay Window. In MTM's collection, GN X71 exhibits the Standard Cupola, Soo 31 exhibit the Extended Wide Vision design. The exterior was painted GN red with a large GN herald on the car side centered below the cupola, and a small GN herald on the end gate. Roofwalk, railings, platform & steps and underbody were black. The stack was silver. Rectangles of white 3M Scotchlite reflective sheeting formed a dashed line along the bottom edge of the carbody. The curved side grab irons were alternating black & white. The car number appeared on the cupola ends and at each end of the carbody, just inside the curve of the grab iron. A "Radio Equipped" lightning bolt slogan appeared between the GN herald and the car number on the short end. Slant-serif lettering was used on the car exterior. In 1967 the Great Northern introduced their new "Big Sky Blue" colors. 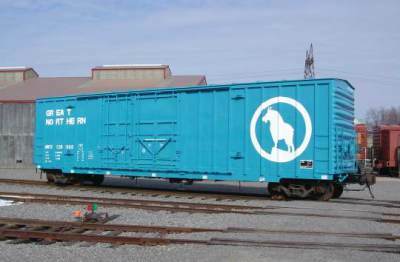 (See box car GN 138660 for an example.) All rolling stock was to be repainted. 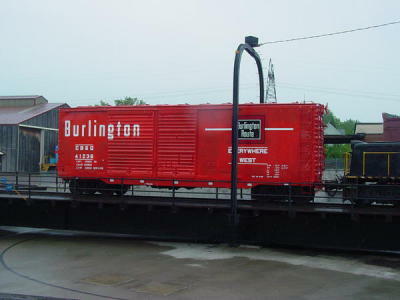 However, the 1970 merger into the Burlington Northern interrupted the repainting program. The following photo, taken by Brian Ambrose at Paradise, Montana July 5th, 1982 shows that X71 never received Big Sky Blue paint. The "Radio Equipped" slogan is worth noting. In the 1960's, railroads were in the process of installing radio equipment in locomotives and cabooses for dispatching. This replaced the old line-side telegraph systems, and eliminated the need for staffing every station with an agent who could copy orders and "hoop them up" to the engineer in the locomotive and the conductor in the caboose. During the phase-in period, when not all locomotives and cabooses were radio-equipped, it was worth identifying those that were. Before - and after - the switch to radio dispatching, the "Radio Equipped" logo never appears. X71 was renumbered 10231 in 3/72, almost two years after the BN merger. (We don't have a record of when the BN Cascade Green was applied.) In 1995 it was donated to the Minnesota Transportation Museum by the BN. We have re-opened some of the windows which were plated over (to protect the crews from rock throwers) and changed the number back to X71. 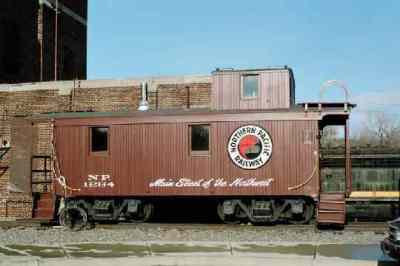 "Great Northern Caboose Cars Nos. X-66 to X-85 and X-86 to X-95" (Great Northern Railway Historical Society Reference Sheet No. 99) by Jack Porzig. 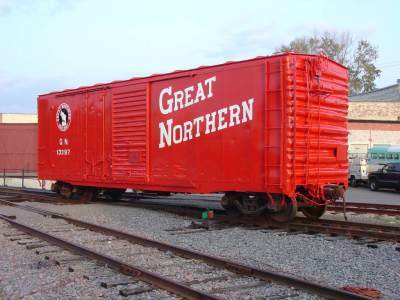 "Perserved Great Northern Cabooses - Update No. 2" (Great Northern Railway Historical Society Reference Sheet No. 258) by Jack Porzig; data p1. 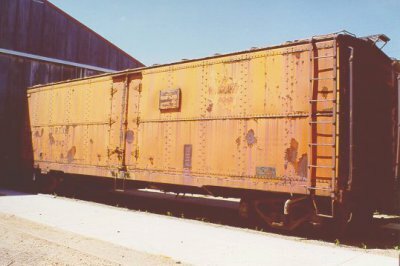 This wood caboose, originally owned by the Northern Pacific Railway, reached its one-hundredth birthday in 2001. It was built in 1901 and was on the NP's roster for sixty-eight years. Its original number was 1144. This was changed to 1264 in May 1942. When this car was retired in 1969 it was the oldest caboose still in service on the railroad. 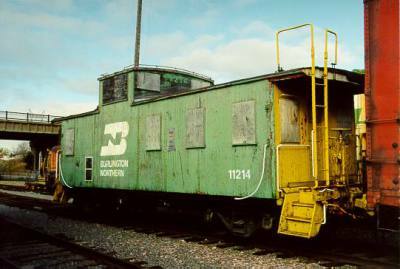 A railroad caboose, located as the last car in a freight train, served as an office for the train's conductor. It also provided a place from which the conductor and the rear brakeman could observe the train while in transit. They would watch for such problems as shifted load and overheated bearings, either of which could cause a wreck. Beds and a stove located in the caboose were used by the conductor and brakemen as a place to sleep and eat if they were required to remain overnight away from home. On the Northern Pacific it was not uncommon for a caboose to be assigned to a specific conductor. In such a case, he might be very particular about the care "his" caboose received and even get shop workers to construct some special features that were not officially authorized. Around 1901-1902, the Northern Pacific was experiencing a severe shortage of cabooses. This was in part due to an unusual number of accidents involving cabooses. Sixteen were destroyed in 1900 and twenty-two in 1901. As a result, the Northern Pacific purchased several batches of new cabooses in 1901 and 1902. Caboose No. 1144 was built for the NP in 1901 at the South Baltimore Car Works in Baltimore, Maryland. It was one of thirty 26-foot long cabooses produced there that year for the Northern Pacific Railway. They were constructed with wood bodies and wood underframes. When delivered to the railroad, these cars carried road numbers 1139 through 1168. The purchase price of No. 1144 in 1901 was $994.76. Caboose No. 1144 apparently spent most of its life on the west end of the NP. As of October 1920 it was at Pasco, Washington. In May 1939, No. 1144 was in service on the railroad's Idaho Division which had its headquarters at Spokane, Washington. The Idaho Division handled trains between Paradise, Montana, and Yakima, Washington. The division's major yard and service facilities were at Parkwater, Washington, just east of Spokane. In July 1939, No. 1144 was sent to the railroad's shops at South Tacoma, Washington, for a complete rebuilding. The car's body was shortened to 24 feet from its original 26-foot length. In addition, a steel underframe was applied, replacing the original wooden one. The caboose then returned to service on the Idaho Division. 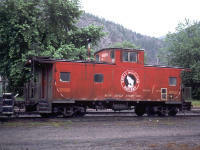 Still based at Parkwater, the caboose was renumbered 1264 in May 1942. It was the third caboose to carry this number on the NP. The first No. 1264 was destroyed in a wreck at Beache's Spur in March 1895. When the railroad constructed a group of new cabooses at its own shops in 1909, one of the new cars became the road's second No. 1264. This car was gone from the roster by June 1917, probably due to a wreck. Third No. 1264, the former No. 1144, was retired and listed as "dismantled" as of July 29, 1969. Reportedly, it was donated to a retired employee that year. After passing through several owners, the wood body of No. 1264 was eventually acquired by the Minnesota Transportation Museum. Somewhere along the line, the number of the car was mistakenly changed to No. 1294 and it carried this number for some years. In the recent past, caboose No. 1264 has been located at the Minnesota Transportation Museum's Jackson Street Roundhouse in St. Paul. There the car served as an office for the supervisor of renovation work at the roundhouse. Subsequently the car was moved to the east side of the roundhouse to make room for major renovation work on the west side of the building. In 2000 the Minnesota Transportation Museum undertook major reconstruction of No. 1264 to replace timbers and siding which had decayed. During the process of rebuilding, workers discovered the caboose's correct number, 1264, stamped into some of its window frames. Such a stamping of a car number was a common practice at railroad shops so that parts from different cars would not get mixed up. 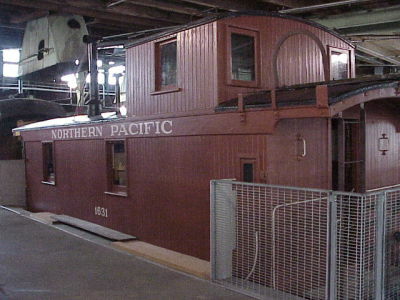 Northern Pacific 1631 was one of the Minnesota Transportation Museum's first restoration projects. Once such cabooses were a very common sight on Northern Pacific rails. Today any caboose is hard to find, and wooden ones are very rare. Burlington Northern 11214, formerly Great Northern X-216. Notes published by the Great Northern Railway Historical Society indicate it was assigned to Breckenridge - Hillyard through service in the 1940's. 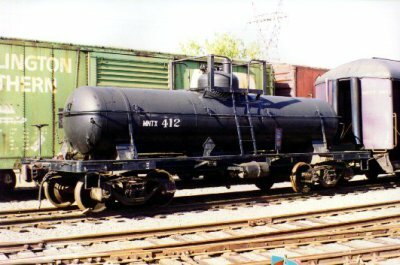 Donated by BN to the Minnesota Opera Company in December 1978, 11214 is now owned by the Minnesota Transportation Museum. "Great Northern Caboose Assignments - 1933, 1941, 1943 and 1946" (Great Northern Railway Historical Society Reference Sheet No. 148) by Harold R. Hall; data p3 & 4. 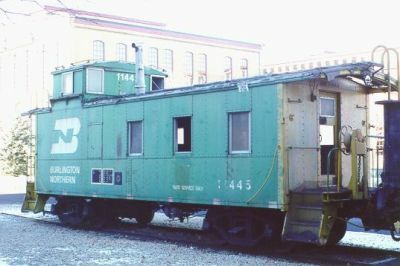 In 2000, Bandana Square in St. Paul, (formerly the NP's Como Shops,) donated BN caboose 11445 to the Minnesota Transportation Museum. It had been on display there for close to 20 years, and the roof was starting to leak, but it was still in decent shape. MTM trucked it to Jackson Street, and parked it on old, nearly-buried trackage that wasn't yet connected. A stencil on the frame says "formerly CB&Q 13500," so that is how it has been known. In 2003, after the completion of the turntable connected its track, 13500 was moved into roundhouse stall 14, part of a wood-shop area being developed. During its short time parked outside at Jackson Street, its roof had rapidly deteriorated, and needed replacement to avoid further damage. Because it is well-suited for the Jackson Street caboose rides (lots of windows and seats) it became the first wood-shop restoration project. Restoration started with replacement of rotten roof boards and canvas. 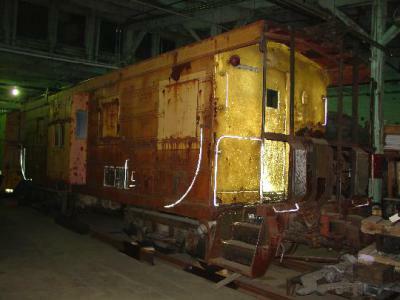 The restoration leader determined that 13500 was most likely the CB&Q's first steel caboose. It is the lowest numbered NE-10, which is the first series of CB&Q steel cabooses. Built in August of 1930, it's center sill, framing, and exterior skin are of steel. The roof, floor, and interior are wood. It was built without electricity. That was added later, and the interior ceiling was lowered two inches to conceal the conduit. It's original color was standard caboose red. That was later changed to orange. It never received the late caboose color of silver - investigation shows it went right from orange to BN cascade green. Railroad shops were typically very well equipped, able to handle major locomotive and car overhauls. Some, like the Soo Line's Shoreham shops in Minneapolis, were even known to construct the occasional steam locomotive from the ground up. The Milwaukee Road, reasoning that their own shops could construct equipment more cheaply that outside vendors, took things a bit further. Their shops in Milwaukee, Wisconsin churned out some six hundred locomotives (as big and modern as northerns,) most of their streamlined passenger car fleet, and tens of thousands of freight cars. When the Milwaukee Shops switched from wooden to steel caboose construction, the ribbed siding was a natural choice. Also natural was using a bay window instead of a cupola, which had safety and visibility advantages with increasingly tall freight cars. Starting with number 01800, 75 were built in 1939, 25 in 1940, 25 in 1941, 25 in 1944, 65 in 1946, 50 in 1949, and 50 in 1951. Each batch could be considered a "model year," with evolutionary changes being introduced with each new batch. In 1956, due the changing economics the Milwaukee changed to an outside caboose builder, and the rib-sided era ended. The last home-built rib-side was 02114. Caboose 02040 is one of the fifty 1949-built cars, which were numbered 02015 to 02064. MTM acquired 992040 from the Dakota County fairgrounds in Farmington, MN, as part of a trade. 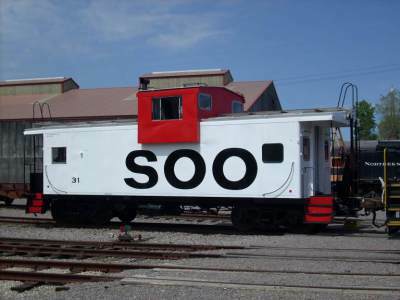 Soo 31, a modern steel wide-vision caboose, was generously donated in mid-2001 by CP Rail. Over the winter of 2001-2002, the interior was repainted and windows reglazed. In spring 2004 the roof was recoated and the paint cleaned. During the winter of 2006-07, a bashed corner of the cupola was repaired, the plated-over windows restored, and the exterior repainted. The following historical data draws heavily upon an excellent article by Bryan Alden and Jason Korth, published in the Fall 2000 issue of the Soo Line Historical and Technical Society's "The SOO" magazine. That issue also included an excellent wall poster detailing the Soo Line's wide-vision cabooses. 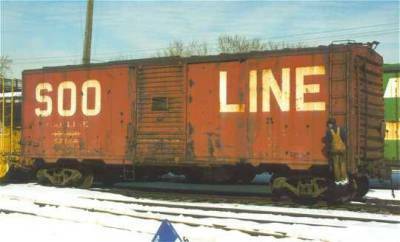 In 1966, the Soo Line began buying steel extra-wide-vision cabooses built by the International Car Company of Buffalo, New York. These replaced a fleet of wooden cabooses which dated back as far as the 1880's. A total of 145 were purchased in seven separate orders between 1966 and 1973. 31 is from the third order, which was for twenty cabooses numbered 16 - 35. This order was placed in 1967, under AFE (Authorization For Expenditure) SE-10-67, and the cars delivered in May of 1968. The cost was approximately $26,000 each. Original Equipment: The cupola was offset slightly towards the B end. Underneath were a radio & battery locker, a storage locker, a utility locker, and a clothes locker. On each side of the cupola was a high-backed reversible seat. A brake valve, brake pipe pressure gauge, and radio handset were provided in the cupola. The main level was fairly open. In each corner an end-facing seat was installed. The A-end left also had a hinged-top desk. ("Left" and "Right" assume one is standing at the B-end, where the handbrake is, facing the car.) Next to the cabinets under the cupola, at A-left was a fuel oil tank and stove, at A-right was the electrical cabinet, at B-right was the restroom, and at B-left was the water cooler. Upgrades/Modifications: The stationary windows were originally safety glass set in double-grooved rubber gasket, locked with a zip strip. All had rounded corners. After new FRA regulations took effect in 1980 (49 CFR part 223), some windows were replaced with plexiglass in screw-in aluminum frames and others were simply plated over. MTM reglazed in 2001 because the plexiglass was deteriorated and hard to see through. Originally equipped with AB brakes, 31 was one of five equipped with Westcode Z1AW control valves in a circa-1980 test. Though still stencilled "Z1Aw", the valves appear to be modern ABD's. The original Spicer generator (a 1 or 1.5kw unit hung from the side sill opposite the brake valves, driven by a gear box on the R3 journal) proved unreliable, and was replaced by a Dayco M3 mounted on the R3 truck side frame. The built-in Motorola radio was removed, probably in the 1990's, replaced by the crew's hand-held units. The original Pyle-National markers were mini "classic" markers on each corner, between the side and end windows. These were replaced early on by lights recessed into the end corners of the roof overhangs. Sometime after 1988, these were deactivated and Starlite model-845 lights with 7" red lenses were mounted just below the roof walks on the ends. The original Pyle-National cupola roof rotating light was later replaced with a Dietz (Visall) model 510-3170 flasher. This had an amber lens until changed to red around 1980, due to regulatory changes. The flasher was probably removed entirely in the early 1990's. The water cooler was removed, probably in the 1990's, in favor of individually bottled water. If the original equipment failed, it was likely replaced by a Prime Manufacturing PMC-400. Great Northern X1735 is a 150-ton Derrick. 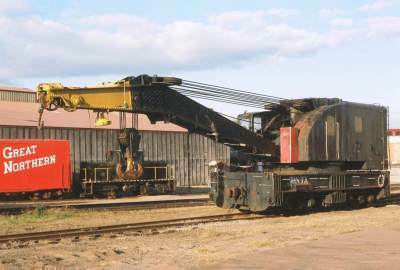 Also known as a "Big Hook" or just "Wrecking Crane," it was designed for putting cars and locomotives back on the track after a wreck. Derricks typically come in 100- to 250-ton capacities, so X1735 is a medium-sized example. X1735 was built in 1914 by Industrial Locomotive Works, construction number 3009. It was originally steam-powered, with its own boiler. Later in life it was converted to diesel power. Its original road number was GN 96014. Later it was renumbered X1735, and after the merger it became BN D158, the number it still wears. As of 1970. X1735 was stationed in Superior, Wisconsin. At the merger, it was one of three 150-ton derricks on the roster. It was retired in the mid-80's and conveyed to the MTM on 10/27/1985, along with boom car BN 959439. 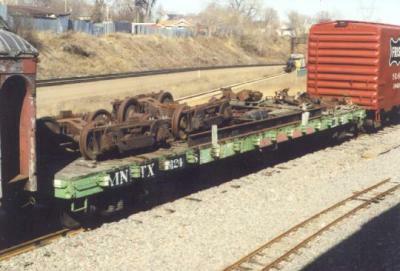 MTM stored it for many years in the Twin Cities Army Amunition Plant (TCAAP), for lack of track space elsewhere. In September 2006, it became the last piece of MTM rolling stock to leave TCAAP when it was house-moved to Jackson Street for display. The photograph above was taken just after the house mover finished unloading it. Several items (mostly exhaust stacks, work lights, and foot stirrups) which were removed for the move need to be re-attached. A working Derrick would spend most of its life stationed in readiness at a main shop, accompanied by flat cars for wreck clean-up gear and retired passenger cars for wrecking crew accomodations. When a derailment occured, the derrick and its train would be dispatched to the location. Once positioned to grab the derailed equipment, the outriggers (three each side) would be extended and blocking and jacks placed underneath to give the derrick a wide stance. Then the tie-downs could be released and the heavy lifting could begin. Today very few railroads keep derricks. It is more cost-effective to outsource wreck clean-up to firms like Hulcher Services, Inc. Such companies use large side-boom bulldozers for the heavy lifting derricks once did. "GN Color Guide to Freight and Passenger Equipment" by David H. Hickcox; text, photo p108. E-mail from John A. Taubeneck, date 05/27/2001. 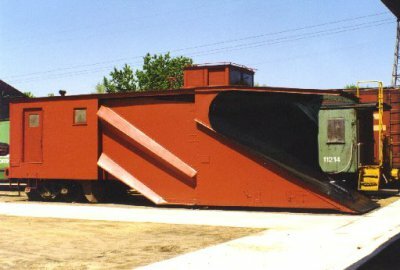 Northern Pacific 30 is a Russel snow plow. Three plowing attachments are visible: The big wedge up front did most of the work, the wings on each side extend to force snow aside so the train won't get stuck, and the flanger underneath clears ice out of the flangeways so the train won't derail. NP 30 was acquired in 1987 and repainted in 1997. It has not yet had lettering re-applied. It has friction bearings.